Time for that promised Cryptek / Finecast review, which is slightly overdue as a result of father Nurgle's blessing. That's right, Ive been stuck in bed for 2,5 days coughing out my lungs. The Crypteks are the technological elite of the Necrons, effectively combining technician and psyker type of units from other races into a single, cheap package. By cheap I of course mean pointwise, because 9,50 pounds certainly cannot be considered a cheap miniature. In fact if you happen to have a set of Deathmark heads spare (you'll have five left over per box of Immortals), you'd be better of getting a Lychguard/Praetorians boxed set in you need two or more of them. For 20,50 you'll have all the bits you'll ever need to make five rather unique Crypteks as well as a ton of cool leftovers. - and one rather cool-looking head . Let me get started with the good stuff, the sculpt has some great detailing and design. I really like how the Cryptek looks like an individual amongst a legion of automatons, yet still fits in perfectly. The egyptian-styled headpiece, combine with the nigh insectoid back carapace make for one mighty fine miniature. The only real issue I have with the design is that you're pretty much stuck with the same pose. Both the neckjoint and the right arm pretty much force you to keep the same posture, nothing a bit of cutting and filing won't fix of course. Still given how adaptable all the plastic kits are, it is a bit disappointing that the GW design team doesn't seem to follow the same approach when it comes to Finecast miniatures. Nutter as I am I ordered two Crypteks, figuring it would give me a nice chance to both review the Finecast material and convert one up. 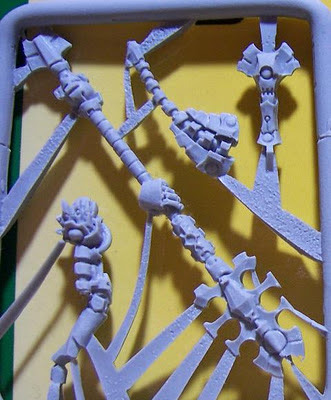 So I ended up opening two blisters with two Cryptek, at which point something already grabbed my attention - the sprues appeared to be different. The mold channels seem to be different on both sprues, something which really struck me as odd. With, in essence different molds, you also get different problems and more complex quality control. 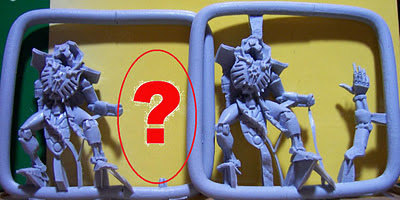 Which brings me to my next point - where in Horus' name is the quality control department - there's a full arm missing! 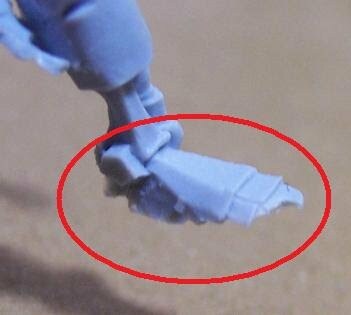 Now there are several other small problems with these miniatures, more on those further below, but a complete part missing is just unforgiveable in my book. Not only is it missng, but the actual channels leading to the part are nowhere to be seen either. This leads me to believe we may be looking at a clogged up mold, again a quality check issue. Bubbles on the finer detailing, in my case fingers on pretty much every hand. Now most of the bubbles are easy enough to fix with a little bit of Green Stuff, the warped staff can be corrected, yet the missing fingers in the last picture are a different matter. These fingers appear to have been snapped off clean, there certainly isn't a bubble to be found there. Now granted the finger is at a very sharp angle compaired to the rest of the bits on the sprue. 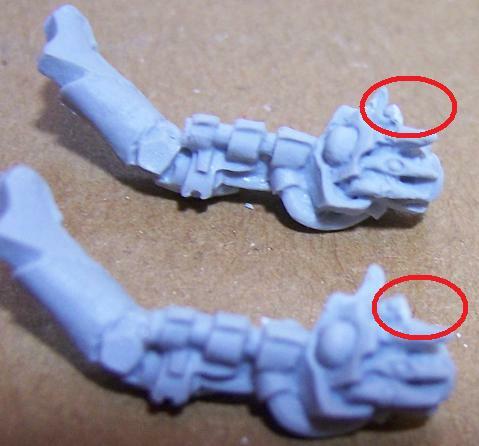 Still, it does let me wonder how they actually remove the sprue from its cast. I am rather torn about this purchase, on the one hand I love the miniature and sculpt. But at the same time, the actual bits that come out of the blister leave quite a bit to desire. The term Crapcast is definitely a too strong to use here. It is still an excellent miniature, yet GW does really disappoint in the quality control department. 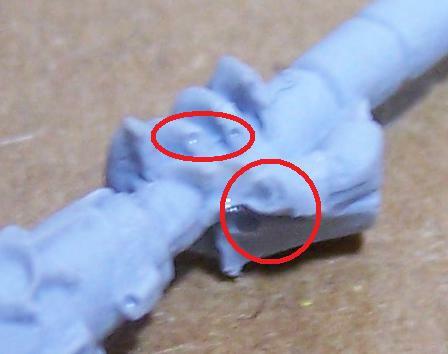 Problems like bubbles and warping are mostly solvable, though at the cost of a Finecast miniature we shouldn't have to be going through that part of the assembly. Completely missing parts is a different matter though! There is no excuse, regardless of a product's cost, for lacking quality control. I saw a box of Dark Eldar Incubi a friend had ordered today as well and lets just say that my Crypteks are picture perfect in comparisson. His Urien Rakarth was virtually perfect though (something I am certain Corvus would love to hear is actually possible). So what does this mean for my future Finecast purchases, well unless GW comes out with a mini I really like and really want to spend an age on preparing I wouldn't be going near this stuff again any time soon. Not until GW can garantee me they will provide a consistenly decent product. If I wanted to gamble I'd head down the road to the nearest casino.....................................colour me disappointed. The actual Finecast material is going to take a bit more testing to see how it really performs, so more on that in a future post. Yeah, I just bought Imotek and an Overlord, and while all the problems were tiny and minor, the number of them was a bit discerning. That is a brilliant idea by the way to make your own crypteks, I'll have to try that one out. Finecast is an interesting idea, but I can't help but feel GW rushed it out the door before getting all the kinks out of the production process. This guy did his own Cryptek custom piece and it looks pretty good IMO. Also at $6.00 a fig vs. $15 it has my vote. I won't ever buy the Finecrap. I feel the same -- the new sculpts are great, but I'm not much of a fan of finecast in general. At £9.50 a piece, it is hardly acceptable that you get such poor quality miniatures. 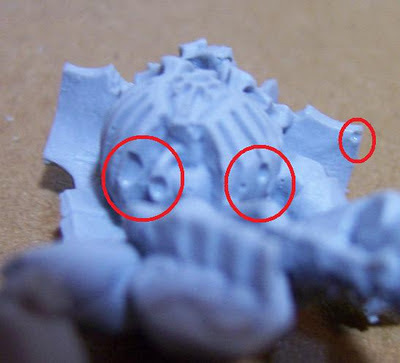 Yes, of course, you can fix the defects with greenstuff, but if you are paying a high price for a miniature, then you have the right to expect a good quality miniature, not one with a hollow foot and dodgy fingers. Take AoW for example, costly miniatures, but quite well made, and literally ready to paint as soon as you stick the parts together, very little flash. That is what I would expect, and not just expect but demand, when I have forked out £9 for a figure. Yep, you're perfectly within UK consumer rights to take them back and demand a refund or exchange for a copy that is free of "minor manufacturing defects". At the price they are charging these need to be virtually flawless, but I see far too many in the blister with these manufacturing defects, as well as filled in detail and chunks of mould material wedged in gaps & cracks. I've had to return a few Dark Eldar minis now. I can't bring myself to buy boxed Finecast product anywhere other than in a GW store any more as it's too much like pot luck whether the contents are useable, at least if I'm there I can make them open every box in the store if necessary to make one decent one - if they can... I'd feel rotten doing that to an independent LGS owner but GW is fair game! I hope you all realize GW customer service, for such things, would send you an entire brand new cyptek box and MORE. I recieved an entire gobbo box for a missing gobbo sprue. A buddy of mine recieved an entire falcon or wave serpent (can't remember) for a missing hull window. GW is good on their trying to make you happy. Just call and don't give a bunch of bad publicity. Well that's great if you ordered it directly from GW. They are indeed generally nice enough to sort something out. I've had plenty of dealing with them in the past (never got a single large order that didn't have something wrong with it, I've seen everything from empty blisters, wrong boxes, all the way up to double the amount of ordered stuff). Wish the quality control department had the same level of employees as customer service, would make things better for everybody. Or, at the very least, cheaper for GW themselves. From a business standpoint they really, really need to keep a closer eye on quality control, too much sneaks through the cracks too often! Sadly all of this is besides the point, great customer service falls flat if the provided product is of inferior quality (naturally this is in comparisson to the promised product). It's all fixable and workable if necessary, but at the end of the day for nearly 10 quid (and ever increasing prices) I for one want the quality that was promised to me. And I'd like to have it when I get my order, not after a crusade of swapping to get a correctly cast miniature!